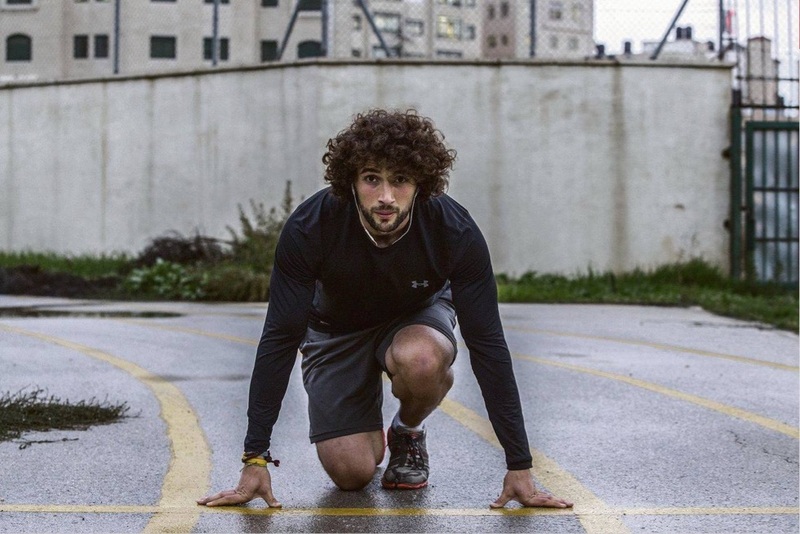 As part of New Arab Mediau2019s goal to unlock Arab creativity, NA3AM has sponsored 25 year old Mohammed al Khatib, a Palestinian short-distance track runner, whose goal is to compete in the Olympics. We sat down with Mohammed and asked him a few questions about his goals and aspirations, as well as his training routine and diet. Check it out below. Profession and Education Background: I have a bacheloru2019s degree in Sociology and Anthropology. I work as a personal trainer and yoga instructor. Years in sport: I’ve been into sports for 4 years now. What got you started?u00a0 The idea of how much hope and joy it would give my people if a Palestinian won an Olympic medal, which has never been achieved before. What is your biggest accomplishment in sports?u00a0My biggest accomplishment was having the opportunity to go to the US and train with one of the worldu2019s greatest coaches and trained athletes. What are one or two things do you currently do in your training that are keys to your success?u00a0 Well, I guess itu2019s having faith in what I do, and the mental focus in what I want to achieve. Do you think your passion for the sport will clash with your career? No, I studied sociology in order to understand the development, structure, and functioning of human society, and to be able to learn how to create an impact on my world. So by running, I am mixing both my passion and my career together. What is your biggest challenge, and what do you do to manage this challenge? The challenge is mainly psychological. the idea of not being able to do it, or if I am not fast enough to do it. I usually go beyond this obstacle through meditation. What do your parents and family members think about your passion for the sport? Some of them supported me and a lot questioned my ability to succeed when I first started. However, having made some important and successful steps (el hamdullilah- Praise be to God), now most of my family and friends understand what I am trying to achieve and support it. How do you think this sport changed you as a person? Well, u00a0I believe that through sports in general, we become a better version of ourselves, and taking on a sport at a u00a0professional and competitive level changes you a lot.. It gave me a lot of strength to go forward in life, regardless of what kind of dream I have, whether itu2019s science, sports, or the arts. It made me see that every dream is achievable, if the passion and dedication is there. From that point on, itu2019s only a matter of time until the dream becomes within reach. Does it get in the way of your personal life? Not really, it actually goes perfectly well with my personal approach to life as a yogi. Whatu2019s your diet like? My diet was an essential part of my training at the peak of the season, which is when I train twice a day for 5-6 days a week. I eat 7 meals a day on specific times. My meals usually have the essential nutrients that the body needs to boost, replenish and recover. So itu2019s broken down to a meal every 2-3 hours. Also, a lot of water! What 1-2 things do you believe differentiates you from your contemporaries who have tailed off in their athletic participation and abilities? Everyone is fighting their own battles and searching for their goals. I just make sure to put a higher goal than myself, and outside of what is usually considered as normal. Faith and vision are what got me here so far. What was the best advice you were ever given? The best advice was from my coach Bill Collins; u201cfeel it in your heart, see it in your mind, and run it with your feet. Where do you draw your inspiration? God. What is your greatest weakness? Doubting myself. Who is your hero? Many people, starting with prophet Muhammad, Jesus, Ghandi, Martin Luther King, Bruce Lee and Muhammad Ali.